Hello! It's time for a brand new Mojo Monday sketch (#208). It's Round or Square week... I hope you will join us! I pulled out a whole bunch of Verve sets and dies to make this scrappy card. The Gandhi quote is from Text Objects. I stamped the frame on the lower right from Making a Statement and die cut using the matching A Cut Above Rounded Scallop Frame Die. My little tag in the center of it was first stamped, using Tag Time, then die cut using A Cut Above Tiny Sweet Scallop Die Set. "Wedding Wishes" is from the retired set, Wonderful Wishes. Finally, I used the A Cut Above From the Heart dies to cut felt hearts, stitching a couple in the upper right and the smallest one onto my tiny sweet scallop tag. 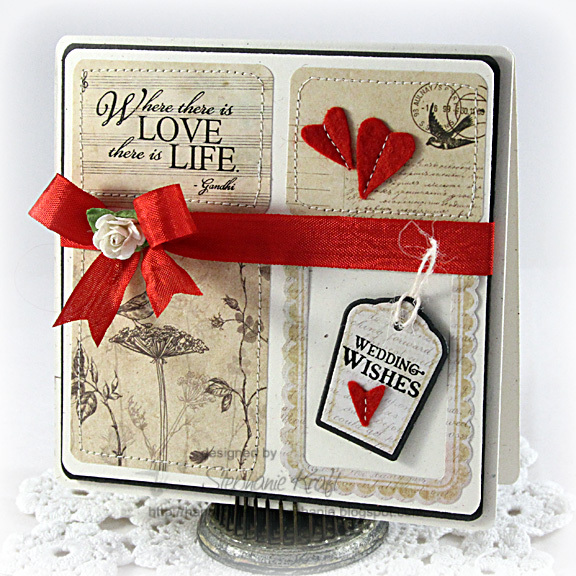 Accessories: A Cut Above Dies: From the Heart, Rounded Scallop Frame, Tiny Sweet Scallop Die Set (Verve); Seam binding, Twine (May Arts), Rose (Prima), Felt, Foam tape, Thread, Sewing machine. Beautiful card Stephanie! Love all the fancy stitching and wee little felt hearts! Thanks for the inspiration! So beautiful, Steph! Love those felt hearts! beautiful! Love how you used the neutrals with a pop of color. LOVE this card Stephanie!! WOWZAS!!! So pretty! I love you combined all the different stamps! The colors are perfect! Your card rocks! Love it. Stephanie, this is just GORGEOUS! LOVE the stitched hearts and how the red just POPS against the other colors! I love this card! The colors and the the paper and the stiching - GREAT. OMG! This is one beautiful card! goodness Miss Stephanie! This is so Wonderful! love your perfect dp's and the Darling stitched felt hear! Just Darling! Love it!